← WORD…One Word, Express In One Hundred Words In One Hundred Days. There are two laws that make life count; the law of continuation and the law of progress. The Law of continuity states that those that wait will waste but those that go will grow. While the law of progress states that you should refuse to stay on the same spot regardless of your present challenges. I welcome you to this great year of light. The New Year greetings as been flying every where on the social media. A lot of people that knows I’m important to them sent me couple of emails wishing me a Happy New Year. So I began to think. This is my thought, What Is New About The Year. All wishes vanished after one week, liars still lie, borrowers still borrow, preachers still preach, fornicators still fornicate, adulteress still practice adultery, the five percent of world changers still control the world. Police still police, killers still kills. Life still revolves around and everything is still the same. Nothing really changed, but I believe the year can change if we all change. Change therefore is the secret that can make anything new. Without change nothing is new and without change it is impossible to please life. Jim Rohn say if you change everything will change for you. Permit me as I rephrase; it’s your new life that will create your new world. Having, thought through the above subject I have came up with three secrets which I think will make the difference as long as you are ready to put them to work. YOUR WORD —What are you saying: It Is Not What Is Happening But What You Are Saying. Words have the same power as God. Whatever God can do the words has the power to do the same. Words are built with force of reality. They will come to pass as long as you believe. Remember, life and death are in the power of the tongue and …you shall have whatsoever you say. You cannot see more than what you can say. Words place limit on your life. The extent of your word will determine the extent of your results. Words are the platform that will take you up more than your equals and display you to your world. What you say has the power to form your world and create your destiny. Everything is a product of word. You are where you are because of what you have said, and you will remain where you are if you shut your mouth. You are a creator; you have the power in your mouth to create your world. This is the secrets that I want you to take to heart. When there was darkness in the beginning and nothing works. God never complain, He engaged the force of words. God said and let there be and all that God said came to past and they are good. So if you want 2015 to be the year that you desire, engage your mouth positively. Remember you shall have whatsoever you say. Complains are not the solution, they only complicate things. Don’t be that person that gets God angry by complaining but be that person that gets Him to convert your word to reality. By positive words you can create a better world for all to live. This entry was posted in Life and Time Management, Self Development, The Secret, Vitamin Of The Mind, You! 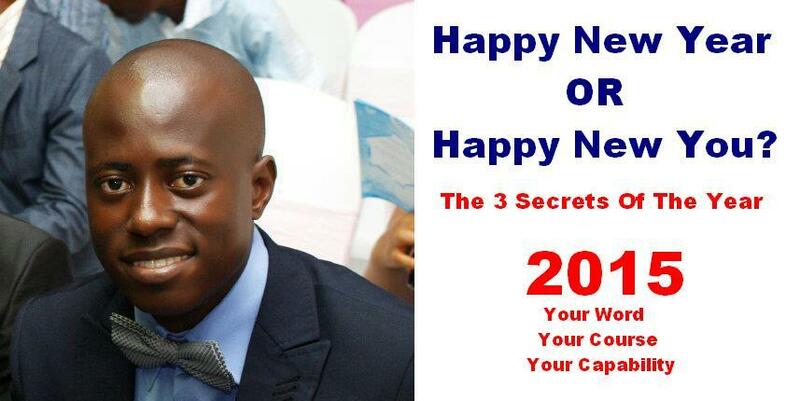 and tagged Bishop David Oyedepo, Happy New Year, Heaven On Earth 2014, How To Be A New Person, How To Be Successful In 2015, Jim Rohn, Pastor E A Adeboye, Rotimi Adedokun. Bookmark the permalink.